The Abell-Hanger Foundation Logo. Courtesy of the University of Texas of the Permian Basin. Image available on the Internet and included in accordance with Title 17 U.S.C. Section 107. 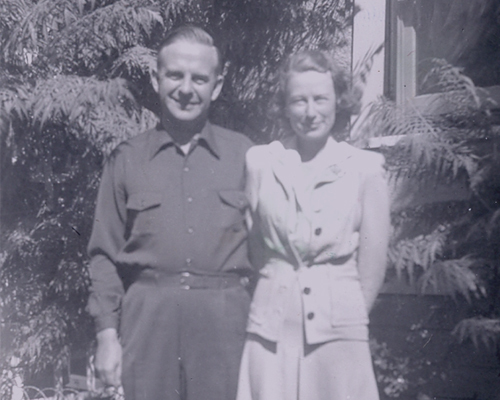 George and Gladys Abell, founders of the Abell-Hanger Foundation. Courtesy of the Abell-Hanger Foundation. Image available on the Internet and included in accordance with Title 17 U.S.C. Section 107. The Abell-Hanger Foundation Initiatives. Courtesy of the Abell-Hanger Foundation. Image available on the Internet and included in accordance with Title 17 U.S.C. Section 107. ABELL-HANGER FOUNDATION. The Abell-Hanger Foundation was incorporated by George Thomas Abell and his wife, Gladys Hanger Abell, in 1954. George Abell, a native of Kansas, moved to Midland in 1927 to work in the West Texas oilfields. A graduate of Colorado A&M University with degrees in civil and mechanical engineering, Abell was a self-taught geologist who made a fortune as an independent oil producer. He was a charter member of the Permian Basin Petroleum Pioneers Association as well as a cofounder of the Permian Basin Petroleum Museum, Library and Hall of Fame. A major supporter of the city of Midland, Abell served as president of the board of the Midland Independent School District and as director of the Midland Chamber of Commerce. He was a dedicated and successful fund-raiser for a variety of charities, including the Midland Memorial Hospital and the Boy Scouts of America. The latter honored him with the Silver Beaver Award in recognition of his leadership in the fund drive that secured the scouts a 6,000-acre camp in the Davis Mountains. Gladys Hanger Abell, born and raised in Fort Worth, was an alumna of Texas Christian University and the University of Texas. She served on the board of governors of the Midland Memorial Hospital and on the board of trustees of the Midland Presbyterian Homes. Along with her husband, she was an active board member of the Permian Basin Petroleum Museum, Library and Hall of Fame. The couple's commitment to community was a driving force in their lives and in the work of their foundation. As George Abell explained, "Business success provides the opportunity to do some of the things most of us dream about doing for our community and its various institutions, organizations and agencies." The purpose of the Abell-Hanger Foundation is to support higher education, youth activities, cultural programs, health services, and social-welfare agencies. In 1995 the foundation had assets of $107 million and an annual income of $6,785,000. In the 1994–95 fiscal year it gave $4,817,681 in 137 grants; cumulative giving from 1954 through that fiscal year totaled $65,783,452. Handbook of Texas Online, "ABELL-HANGER FOUNDATION," accessed April 24, 2019, http://www.tshaonline.org/handbook/online/articles/vra01.